Do teachers choose competition repertoires for students, or students choose by themselves? Many teachers may want students not only to examine and choose repertoires by themselves, but also to consider effective ways of practice, listen to other pieces, study the background of pieces, etc. If you buy a CD officially recorded for the 42nd PTNA Piano Competition, you are entitled to share the new online service "My Repertoire" with three students without any charge. This page is designed to help choose the repertoires by listening to sample recordings. 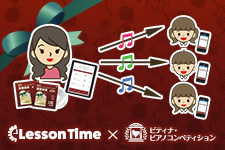 For the registration, please entry in the online application "Lesson Time" first. "Lesson Time" is a service that helps teachers to organize and manage lesson schedules (students' name list, homework check list, group contact, website building, etc.). Here is the process of using the "My Repertoire" (>see images). Creat students' accounts in "My Repertoire"
Choose which grade of the competition they will participate. Click "choose repertoires" button and move to the repertoires page. Share impressions and insights of pieces by listening to demonstration performances. Teachers can recommend other pieces from repertoire list. Students can click "Like" button on teachers' posts and comments. Students may listen to the repertoires of other grades once they decide the program of the current grade. Here is the testimonies from users of "My Repertoire" service. Keiko Matsushita (Tokyo) says this service is simple and efficient. It took only 30 seconds to complete the entry process and she could share the repertoire information immediately. "We can share repertoire information and its demonstration perfromances anytime, so I always bring in-ear headphones and listen to them whenever I want. It only costs 300 yen to add more than 3 students, so parents feel easy to ask me to add. One of them said that it is a good way for their daughter to listen to the audio files ( performances by 2 different pianists) and have certain imagination in advance, as she usually takes time to complete the score reading. Now I ask all the students and their parents to listen and discuss all the repertoires in advance at home. It is much easier and efficient than examining all the repertoires in the lessons. And it is also helpful to have two different types of performances as a reference, if we are not be able to agree on interpretations." "My Repertoire" is very convenient, says Kasai. So far, she played all the repertoires in the lessons in order to choose programs for all the students. "With this service, they listen to and choose programs at home in advance, so I take time for another important elements in the lessons. One of the students could not decide whether he takes part in the competition or not as his parents are too busy to support him, but he is encouraged to take on a challenge with the help of this service. Eventually, he decides to take part in both solo and duo divisions. As this service is not only for choosing repertoires, but also for self study of repertoires, students are enable to work on lesson and practice in a good balance."